What does persistence mean to you? 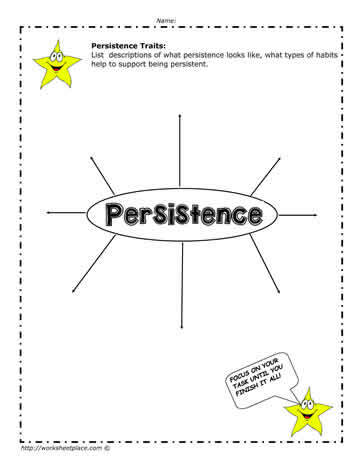 Use this worksheet to show all the ways that you are persistent. Not giving up and remaining focused are examples of being persistent. A great learning skill in school is to be persistent which is also a worthwhile character trait. Students should be able to explain where they are quite persistent and areas they need to be more persistent. Using persistence as a goal is another great activity to have students determmine where their strengths and weaknesses are.